During the regattas this last weekend the wind was all over the place. From nuking to light it seemed to vary by the day and even the hour. For tonight we had the fortune of a great Easterly filling in at around 8-10 knots. We had eleven boats out for the fun. We decided on a course that we have used before that plays heavily on a strong Easterly: Start, Blacks, Gov and back to start. It had to be a quick course because there wasn’t much light left and we had a barbecue to get to! On sailing Pair A Dice, I had determined that the heading hard on the wind was 60 degrees, so I set up sailing away from the line keeping 60 degrees on the compass roughly lined up with the start mark. The problem was estimating the time to the line since sailing away from the line we were bucking waves and going the opposite way we would be surfing and going much faster. Somehow we made the jibe at the right time and only had to stall a little at the line and ended up over the line first with some larger boats attempting to roll us to windward. We scalloped up enough to leebow first Diver Down then Pacific Spirit. Slowing these boats down allowed us to round blacks first and we were off on the long run to Gov. It was interesting watching all of the boats behind us. The ones using whisker poles were able to accelerate through the pack. Odonata was flying its spinnaker and showing the advantage of spinnaker use in downwind sailing and was moving quickly through the pack. All the boats did their best to prevent getting their wind blocked by other boats. We had a great turnout for the BBQ with close to 50 people joining in the fun. 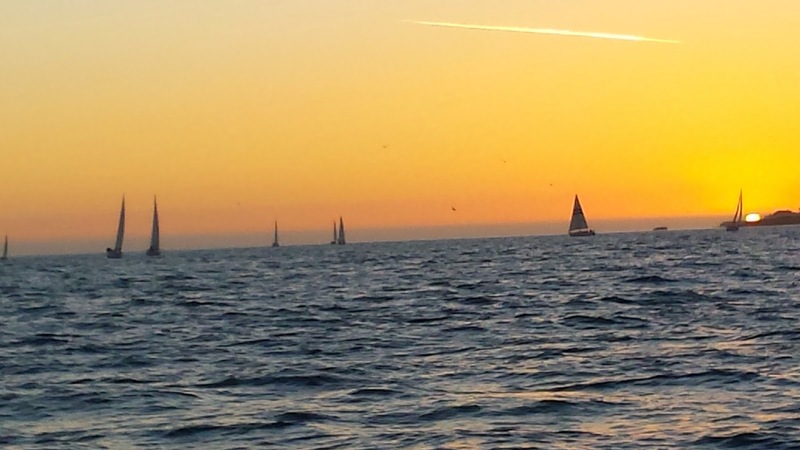 Santa Cruz Yacht Club is hosting a brand new kind of regatta. They are calling it a “log regatta”, and it is being held October 18. How good are your boating skills and your knowledge of boat speed and navigation? I think it would be fun to find out. Sailboat and power boats will be participating. The only instrument you can use will be your senses and a compass (no gps, watch, or speedometer). The course will be over 11 knots long and you must judge how long it will take for each leg. Your accuracy in these estimates will be how you are scored. Your times for each leg will be recorded and documented and the boat with the most accurate estimates will win. If we get five Catalinas or similar sailboats, there will be a first and second place trophy for our division. Keep an eye on the SCYC.org website, which is your portal to the regatta network. The notice of race and rules for this “regatta” will be posted after October 4. The fee for entry is $10 and it seems like it will be a blast! Lets show the power boaters and other sailors what us Catalina sailors can do!